It's easy to assume the physical needs of a homeless ministry. But you might be surprised that your assumptions are wrong! We've come up with our most-needed items and divided them up into months. 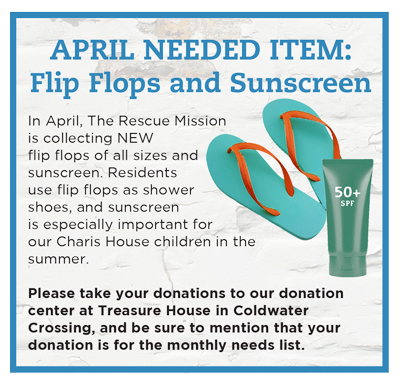 Each month we're collecting specific items to grow our inventory to better serve homeless men, women, and children. Also this month: FILL THE FLOP! Please bring all in-kind donations to Treasure House Thrift Store and Donation Center at 5327 Coldwater Road, Monday through Saturday from 9AM - 7PM. Interested in doing a donation drive? Contact Jamie at jamie@therescuemission.net. You can also check out what we'll be collecting in months to come by downloading our Monthly Needs at a Glance. We have weekly pickup available for those who have large items, or large quantities of items. Please call Treasure House at 260.456.9200 to schedule a pickup. For donations, such as houses and vehicles, please contact our administrative office at 260.426.7357. If you, your group, church or business would like to have a drive, please contact us. We can let you know our greatest current needs.